The Sabian Symbol for the Sun’s position (Sagittarius 3°) speaks of a need we feel during a time of confusion. 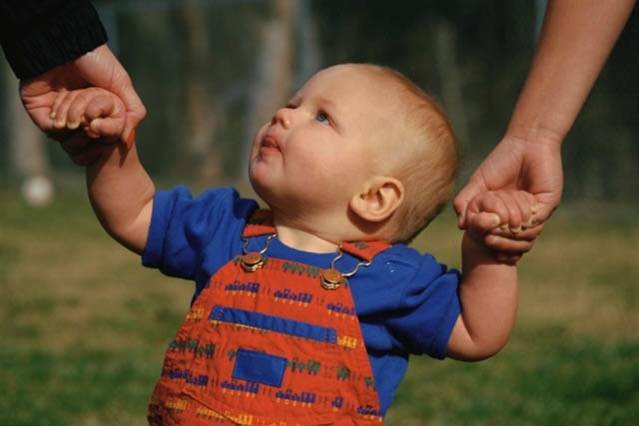 ‘A little child learning to walk with the encouragement of his parents. The natural assistance of superior power during a crises of growth.’ It’s not an easy task to learn to walk, but once on two feet, a child’s view of the world changes radically. Oceanic Neptune watches the opposition between Sun and Moon from a square in Pisces his favorite location. He has just turned direct, and perhaps like the encouraging parent, watches the faltering steps of the children who stumble in their attempt to stand tall and see the world in a new way. Neptune, takes us to a higher realm, which we may not be ready to interpret, just as a small child bursts upon the mysteries of a whole new landscape, and takes time to process what she sees. Here is a design from the American Indian Museum illustrating the 18+ year cycle of the Major and Minor Lunar standstills. This was closely watched by people who lived beneath the sky on this continent and in Stone Age Europe. 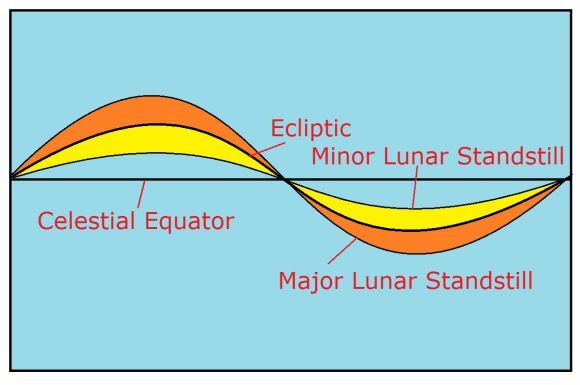 We are now at a Minor Lunar Standstill period. If you keep a close watch on the rising and setting of the Moon across a familiar horizon you will notice a journey over the (almost) 19 year period. This is built into Avebury and many other stone circles. It is also the way people have learned to predict eclipses. As the lunar nodes begin and end their 19 year cycle at the Major Lunar Standstill at 0° Aries for the North Node. At the Minor Lunar Standstill where we are this year, the North Node is at 0° Libra. All this beautiful and mysterious action of the Moon is due to the tilt of the Earth. Off kilter we spin creating a number of earth/moon/sun cycles that speak to us and our ancestors about the potential for interaction between us and the cosmos. Holly and Mistletoe play a big role in Druid rituals for the Winter Solstice. Mistletoe is cut on the 6th day of the new Moon after the Solstice with a Golden Sickle and is supposed to land untouched by human hands on a linen sheet. How Mistletoe is cut with a golden sickle, is a bit of a mystery, but gives us a clue about the Sun’s return! Mistletoe berries are passed out in our present day Druid ritual here in the New World. The seeds look like little Moons and are a symbol of the sperm of the gods, promising the return of the Sun and fertitlity for animals and humans alike. 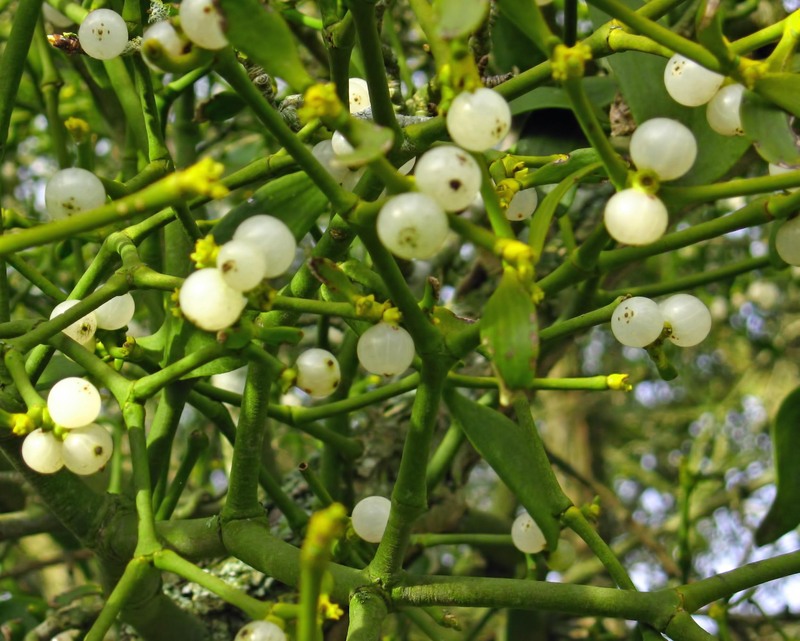 Another name for Mistletoe is All Heal. It was used in several forms for healing, spasms, nervous disorders, especially epilepsy. At Christmas time it remains a symbol of fertility where kisses are exchanged. Holly is the tree who battles with Oak for the crown of the year. At the Summer Solstice, the Holly King spears the Oak (the Sun) and, at the height of his journey, he is wounded. The battle of light and dark turns, even as the heat and feritility of summer grows stronger. 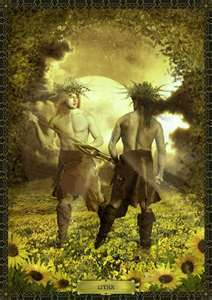 At the Winter Solstice, the Oak King regains his strenth and wounds the Holly King. Winter closes in, but light cannot be turned back, and the days grow longer. 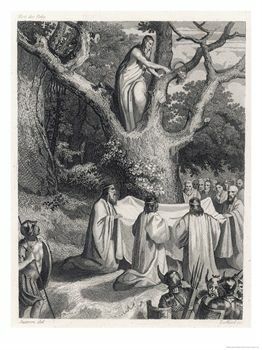 as they tremble on the branch. cut us to the core. You might think the next New Moon (in Sagittarius), the one that falls before the Winter Solstice would be the new Moon of greatest darkness. But I think the new Moon in Scorpio is about exploring and honoring darkness, not releasing it as at the Solstice. Scorpio has the potential to invite us to ‘Plunge ahead into the Unknown.’ This is the season where we can delight in early, twilight with time to feel darkness. Just as the new Moon, the invisible Moon is always about darkness because the Moon is tightly embraced by the Sun’s light, so too, Scorpio gives us the opportunity to explore darkness in a brightly lit society. Hallowe’en is the season when we turn to look at what we fear is traveling, just behind us, death, dissolution, decay. And Hallowe’en lingers around us in November. The new Moon in Scorpio falls on the 11th of November this year; the same day we honor veterans in America. This is Martinmas in Europe and the British Isles. St. Martin was a Roman soldier who became a monk, and was famous for cutting his cloak in half to share with a beggar in a snowstorm. St Martin’s day saw the slaughter of cattle and poultry in a time before refrigeration, and was the final harvest of the year. It’s a day of feasting and bonfires, a thanksgiving feast day before food becomes scarce. In Medieval times folks were ordered to fast three days a week between St. Martin’s Day and Epiphany. Did this apply to the rich and powerful, to the Bishop who sent down the order? The speaker, thinker, messenger, Mercury stands close to the new Moon and Sun. Will we hear what is held in this moment of time? If there can be a place and moment of silence, perhaps we can hear the voice, particular to each of us. Scorpio is a watery sign ruled by Mars. Messages written in water are often missed until they become a flood that carries away what was familiar. Mercury in a water sign takes his role as dream ambassador seriously, because our dream are written in water, and it takes the a psychopomp, like Mercury to carry them. The Celtic tree calendar, as designed by the poet Robert Graves, gives this lunar cycle to Ngetal, the Reed. This continues a theme of wetness, swamp mysteries. (photo by Robert Fuhro ) swamp, full of life to a clear swimming pool, which supports very little in the way of living potential! 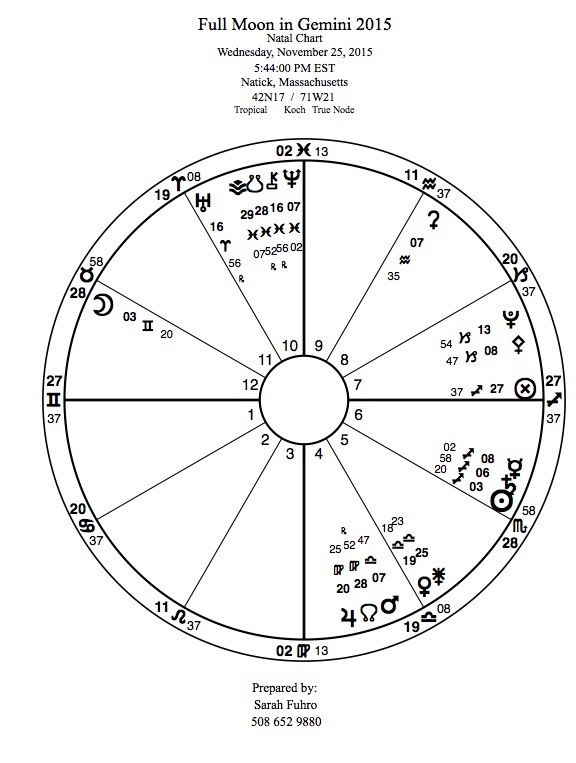 Chiron, the healer makes a watery trine from Pisces to the Sun/Moon/Mercury trio. Like Scorpio, Pisces, is a sign of giving way to a new season and an appreciation of change, mobility. Pluto is in the mix as well, with a sextile to both Chiron and the new Moon/Sun combination. 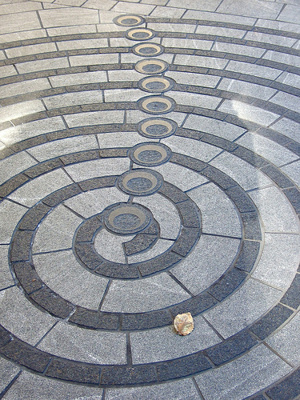 Pluto has his feet firmly planted in the earth (Capricorn). He demands new forms and structures and enough with all of this watery formlessness. Jupiter agrees with this as he faces off with Chiron from Virgo, earthy and practical. Out of the falling leaves comes the soil of next spring, and so in our own lives we are given the opportunity to dissolve, and then rebuild. In the meantime, don’t miss the 2016 Lunar Calendar filled with new possibility, beautiful artwork and poetry. http://www.thelunapress.com!